I returned to Colombia via Port of Santander, which is separated from Venezuela through the International Bridge Union. There is no immigration control so when I went through Cucuta, (60 km from Puerto Santander) I had to return to Venezuela to seal me out of the country and entry into Colombia. 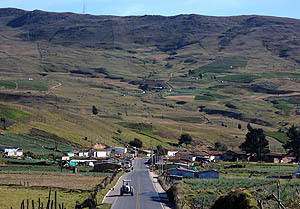 From there, the route starts to rise from 320 m to 3,300 m in only 130 km. Up there in the wasteland of Berlin’s the temperature can reach -5 and because the tiny rooms cost the equivalent of two plates of food, the option to rest on a bed is a must. Way to Bucaramanga the route decends abrouptly 50 km. Because of the works and the number of trucks, the route becomes dangerous for those going down, and certainly a real martyrdom for the ones who climb. I would not recommend to anyone. In the capital of Santander city, Duque received me, one of those Colombians who have a passion for receiving cycling travelers and who dreams hit the road for a long time. Art teacher and painter, in those days Duke also received another argentinien bicycle traveler who was pedalling from Argentina to Alaska, Andrés Fluxa. For a week I shared the route with Andres, we pedaled the endless rise Chicamocha Canyon, camped in the middle of the country or where we could to protect us from the cold. We also share the place to sell at Villa de Leyva and Bogota. I think finally Andres understood that there is no better place to sell than in cities on weekends. The streets are filled with people who support laudable stories and the sales multiply. After several days of sale Andres got the money to buy the ticket to Panama and a good saving to start with Central America. The day of his departure he called me from the airport of Bogota extremely worried because he had no out ticket from Panama and they would not let him board. Being a professional in the field, I jumped out of bed and had to go to an internet cafe and in record time buy a plane ticket to Panama from Costa Rica. The procedure is simple, through expedia.com you can buy a ticket and cancel the purchase within 24 hours at no cost. That’s the secret to deal with airlines who do not sympathize with travelers. During our stay in Bogota Camilo Rey received us, a cycle-activist who loves everything that has to do with a bike. Bikepolo player and a great heart man always willing to lend a hand to those who come pedaling. Camilo, along with people of Impact Hub and different groups of urban cycling organized a talk where I made a presentation of my trip. “Bogota is a city characterized by its processes around the use and promotion of cycling,” he explained. “It is the city with the largest network of bicycle paths in Latin America, with over 400 km”. In Colombia, 14ochomiles, is a chain of stores that specialize in camping items and clothing for outdoor activities, there I met Pablo and Hector, that knowing about my trip did not hesitate a minute to give me a tent and the clothes I needed. From Bogota the route guide me to Medellin, with more downs than ups, heavy traffic, and some rains. On the way I slept in cheap hotels and camped, I hit the door Villeta firefighters who gave me a bed too. In Medellin Carlos Carvajal host me, a reference in the cycling of Colombia, who cycled for almost two years South America. 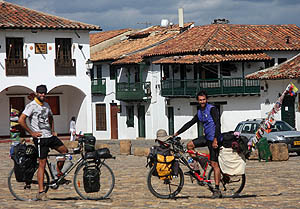 Carlitos is one of those persons who receives cyclo-traveler very often. He and Diego Duque organized a conference about my trip. There the paisa, as it is known the native of Medellin, gave me strength to keep on track. I was surprised by the number of Colombian students I met who were about to travel to study in Argentina, or who had already been there. According to Manuel, my roommate degree in Political Science, the UBA (University of Buenos Aires) is considered the third best university in Latin America, after the UNAM (Mexico) and USP (University of Sao Paulo, Brazil). “In Colombia the cost of college depends on your socioeconomic level”, he said “while the UNAL (National University of Colombia) I paid the equivalent of 500 USD per semester, I had a partner who paid 100 USD”. From Medellin I also flew to Buenos Aires, in my case just to make a break, relax, gain weight and visit family and friends. Also with the people of Halawa I was in the Expo Bici promoting my documentary. On my return to Colombia I took advantage of the holidays to sell in the streets of Medellin, and thus raise the money needed to fly and explore the Antilles, my next destination. Colombia is not the narcos and violence country that most of the time the international press wants to show. I did not see that part, that is not the image I have of this country. What I have of Colombia are friends, the Colombian is a friendly, hospitable and generous guy. Colombian is cool, it’s good people.